Tesla may be known for , but the electric carmaker first made a name for itself nearly a decade ago with the Roadster. Based on the Lotus Elise, it established Tesla as a pioneer for electric car technology. A isn’t due to arrive until at least 2019, and unlike the original it won’t be based on a Lotus. So the people at Onpoint Dyno decided to create a spiritual successor by converting a Lotus Evora 410 into an electric sports car. 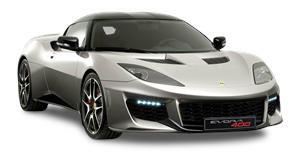 Dubbed ‘Blue Lightning,’ reports that the electrified Evora uses the powertrain from a Tesla Model S and two Chevrolet Volt batteries. After just five months, it's nearly ready to hit the track. Currently, the 410 is the , with a 3.5-liter V6 producing 410-horsepower and a 0-60 mph time of 4.1 seconds.